She-goat, or he-goat was recorded as the symbol of Istria as early as the times of the ancient Romans. 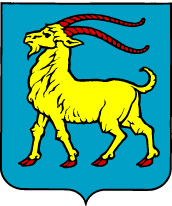 The traditional coat of arms of Istria as a Habsburg margraviate is-blue frame, the triple green hill, and the golden goat with red horns and hooves. The figurative solution of the coat of arms, adopted by the Regional Assembly on 1 July 2002 is based on one of historic coats of arms of Istria from the 9th century. The model for the solution is-the blue frame with a golden goat with red horns and hooves-taken over from the book of the Austrian heraldist K.Lind: "Stadte-Wapen von Österreich", printed in Vienna in 1885. The flag is a horizontal blue and green two coloured flag with the coat of arms in the middle. Blue symbolizes the Istrian sky and the sea, and the green symbolizes the Istrian interior.